Photographer and experimental filmmaker Sharon Lockhart’s cinema is one that straddles multiple realms. It has been noted that her film works attempt to explore the boundary between photography and cinema. For one, most of her films are composed with a static camera and with self-conscious framing that photographs actions head on. The compositions serve to remind us that the camera’s vision is highly restricted and there’s a world that lies beyond its four edges. This is also reinforced by the numerous activities that take place off-screen in the films. Since the prime distinguishing factor between cinematography and photography is time, these works are highly conscious of their temporal dimension. While Lockhart introduces the element of time in her photography by perturbing the order in which the photographs were taken, she chooses to preserve the linearity of time in her films. Instead, she invokes the sense of passing of time by retaining the photographed image for a long time – by using overly prolonged shots of largely unchanging actions. It is perhaps best to look at her films in relation to her photographs and vice versa. Another prominent aspect of her cinematographic work is the relationship between people and the spaces they inhabit. These surroundings may counterpoint (an opera house in the Amazon, a basketball court in Japan) or define (a labyrinthine industrial corridor, dusty Polish courtyards) the way of life of the people within them, but, in all cases, the kinship between the two remains of central interest. Another dialectic that permeates Lockhart’s filmography is that between art and ethnography/anthropology – between straightforward documentation and authorial stylization. 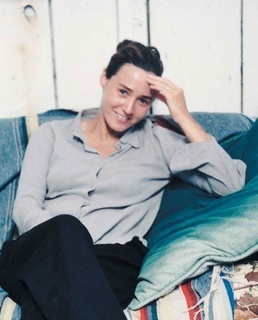 Lockhart seems to be conscious of the fact that such a tug-of-war always runs the risk of entering the territory of exploitation and unwarranted anesthetization (“I was well aware of the problems of filming in another culture and had begun to think about the way ethnographic film works within an art context.”). She overcomes this deadlock, as do other documentary filmmakers, by choreographing routines (there are dance trainers and movement advisors who work in Lockhart’s films), by making the subjects active participants in the filmmaking process and by not imposing preformed psychoanalytic notions on them. She cites Jean Rouch as a major inspiration (“I became even more fascinated with ethnographic film, especially Jean Rouch. He took ethnographic film to a whole new level. His ideas of collaboration and being a catalyst are especially interesting to me, like the way he lets his subjects choose fictional characters or roles, through which something very real comes out”). Consequently, the actions in her films are both spontaneous (the anthropological) and rigged (the aesthetic) wherein the participants both perform and behave. They are carrying out their daily tasks and, at the same time, executing the choreography they have practiced. Lockhart’s debut project, Goshogaoka (1998), shot in 16mm in a basketball stadium in Japan, opens with the image of a theatre curtain, thereby setting up the motif of theatricality that pervades the rest of the film. The stillness of the image is interrupted as we witness almost two dozen high school girls in sports outfit running in and out of the frame – apparently in a circle – making the shot indicative of the cinematic system itself – the projector and the screen (In one segment, the “actors” run towards the camera, projecting themselves on us, as if mirroring the light particles that bombard the screen within the film). In fact, Goshogaoka, in its entirety, could pass of as a metaphor for filmmaking where seemingly random acts are shaped and stylized into a coherent whole (“everyday routines recontextualized and reinterpreted as dance”), where order is arrived at through disorder and where the banal moulds itself into the beautiful. The impeccably ritualized nature of the activities in the early part of the film – as one would associate with the Japanese-ness of the participants – gives way to more improvised individual tasks where the girls “perform” consciously in front of the camera, floundering at times, as if on the audience’s demand. The illusion of the work being a straightforward documentation of routines is also broken by Lockhart’s self-referential framing and utilization of off-screen space wherein we are made to acknowledge that all that we see is as much posed as it is improvised. This concept of the cinema space, by its very purpose, being a zone of contemplation would be explored further in Lockhart’s next film. 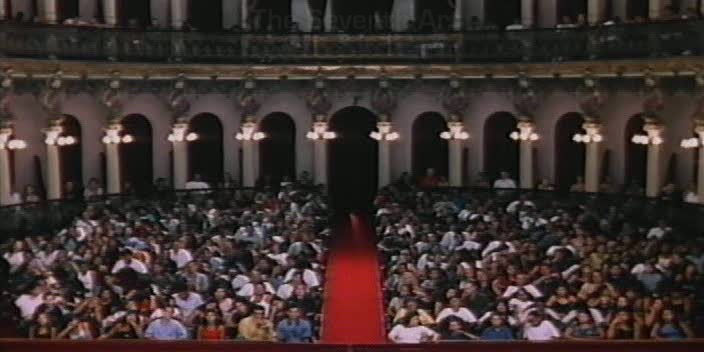 Teatro Amazonas (1999) is set in the eponymous opera house in Manaus, Brazil, which one might remember from Herzog’s Fitzcarraldo (1982), and consists of a single half-hour shot filmed in 35mm of a native audience listening to a piece of avant-garde music (scored by Becky Allen). As the film progresses, the voices of the audience completely overpower the vocals of the music in the same way our concentration is distracted by the length of the shot. The camera is on the stage and observes the audience head on, essentially making the film screen a portal of sorts through which cultural exchange – between two worlds, one might say – takes place. One is reminded of Kiarostami’s Shirin (2008) in the way the screen additionally acts as a mirror where one audience – watching Lockhart’s experimental work – resembles the other – listening to Allen’s experimental work. Being set in South America, the reversal of the subject-audience relationship here elicits other intriguing responses from us as well. Lockhart’s camera places us on the stage, with the Native American audience staring at us, and hence manages to reverse the colonial gaze (if one makes the fairly questionable assumption that the audience is predominantly European/North American). The “colony-wise” credits at the end only compound this revisionism. In that sense, each passing minute ratchets up the tension instead of accustoming us to the new space. Although Lockhart’s films don’t possess such overt political objectives, this particular film works on such an extreme Brechtian level that such a response doesn’t seem invalid. A companion piece to Goshogaoka in a number of ways, NŌ (2003) is a highly formalist work that attempts to study the properties of the film frame with the agricultural process of mulching as the backdrop (the ethnographic aspect of the film is very subdued). 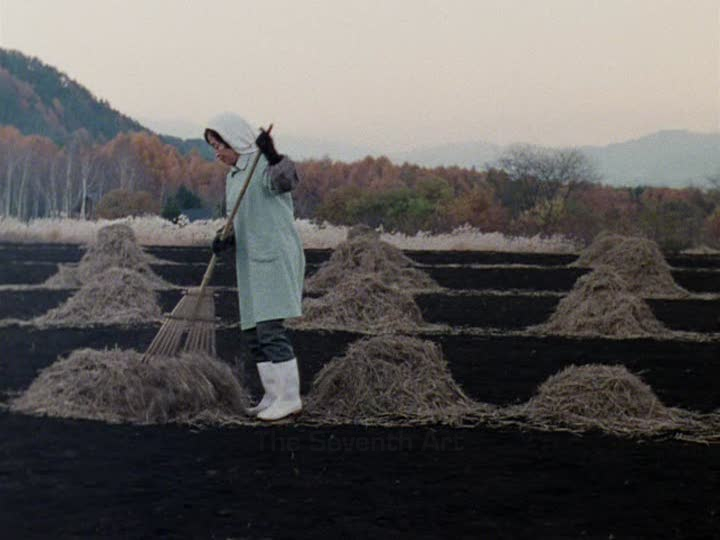 The film documents two Japanese farmers (Masa and Yoko Ito) amassing heaps of hay and later spreading them out on a field. We see that farther the farmers are from the camera, the longer they take to traverse the breadth of the frame. As the amount of hay gathered decreases with decreasing distance of the workers from the frame, we realize that the geographical and representational areas of a region are in inverse proportion to each other and that the field of vision of a camera is conical rather than cubical. Although NŌ is an examination of the relation between the XY plane and the Z-axis, it also functions as a painting unfolding in time. The screen is bisected by the horizon which separates the black soil from the reddish sky. As the farmers spread the hay over the soil, they end up coloring the lower half of the frame, literally assembling it. Coupled with ambient sounds of bird chirps, NŌ is like an impressionist painting on film in which both rapidly and gradually varying hues of light are registered (A little more plot and it could pass off as Jean Renoir). In that respect, the semi-static-semi-dynamic composition of the film largely resembles those of James Benning, where, too, quick changes in landscape are pitted against microscopic ones. Lockhart’s longest feature to date, Pine Flat (2006) is shot in the eponymous rural area in California where she apparently lived for four years. Consisting of twelve silent ten minute sketches – most of them presented through skewed compositions – all of which deal with kids and teenagers residing the locality, Pine Flat preoccupies itself with the study of cinematic time. The first six sketches deal with children who are alone and the next six with groups of teenagers and kids hanging out together. Lockhart reveals that she wanted to investigate the subjective experience of time in both these types of situations. In both cases, the kids seem to be somehow beating boredom by indulging themselves and each other (The viewer’s experience of these stretches of time also plays a part in the film’s exploration). Lockhart’s idea of disrupting chronology in her photo works translates to prolongation of the film image in this work. Consequently, the segments are reduced to their functional minimum and come across as little more than photographic – a girl reading a book, a boy playing the harmonica, a kid waiting for the school bus, a boy sleeping on the ground and so on. This return to cinematic zero (if one can approximate cinema as photography in time) is also mirrored in the implied return to zero of nature. The kids playing and carrying out their petty activities happily in the lush woods is the image of serenity itself. Alternately, this sort of persistence on mundane gestures defamiliarizes them, elevating the quotidian into the realm of art (similar to Walhol’s works) and eventually urging us to see them with fresh eyes. In Lunch Break (2008), Sharon Lockhart seems to have taken to heart the Douglas Adams quip that time is an illusion and lunchtime doubly so. 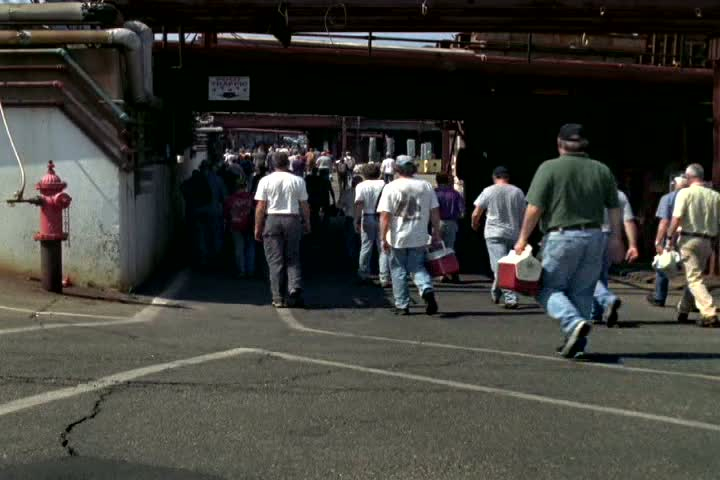 Shot in Bath Iron Works, Maine during the titular break period on a typical day, the film consists of a single tracking shot through the central corridor of the factory slowed down digitally to 75 minutes (It is probably the only film I’ve seen that takes longer to see than to shoot!). The dolly moves along the Z-axis of the frame – reminiscent of Kubrick’s tracking shots in the WW1 trenches – as rusty lockers and other furniture trudge past us. The film almost entirely consists of vertical planes, straining and training our eyes to such an extent that we start recognizing the minutest of lateral movements that the camera undergoes. Beyond a point, our eyes start playing tricks on us. If we concentrate at the centre of the image, the edges seem to melt away and the camera seems to move pretty fast and if we choose to pay attention to the edges, the camera seems slower than ever (an illusion that might be very useful in genre filmmaking). At times, when there are only machines in our view, we are not sure if we are witnessing a tracking shot within a real space or a zoom into a photograph (The one Lockhart film that most resembles Wavelength (1967) is this). It is only when the humans enter the frame that we have reference for the camera’s motion. Likewise, it is only during the lunch break that the human elements, for once, triumph over their mechanical counterparts, which continue to drone even during this cherished recess time. Over a 110 years after the Lumiére brothers photographed workers coming out of a factory, Sharon Lockhart embarks on a similar project, attempting to chronicle workers exiting a factory – Bath Iron Works again – over a time span of five days. Unlike in the earlier film, we don’t get to see the worker’s faces. Only a few of them even seem to notice the presence of a camera. Over the week, we see a number of workers walking into the frame, moving away from the camera and vanishing at a point near the centre. There is no strict pattern – in attendance, in attire or in mood – that is evident as we move from Monday to Friday. No insight into the psychology of the workers is given either. Instead we are left to speculate about the contents of the lunch boxes (which had made their debut in Lunch Break) and back packs (which many seem to be carrying), about the kind of work these workers are doing (not all seem to be involved in physical labor) and about the time of the day and season of the year (given the changes in the intensity of natural light). It’s kind of like guessing the contents of those mysterious trains in RR (2007). A man stops to chat with another. We barely hear their voices and are left wondering about the poetry of their lives. One striking thing that is evident is that the majority of the workers are wearing denim. This might give us an insight into the taste and economic standing of these people, but it is also suggestive of mass production of commodities, discrediting of human skill and homogenization of culture. 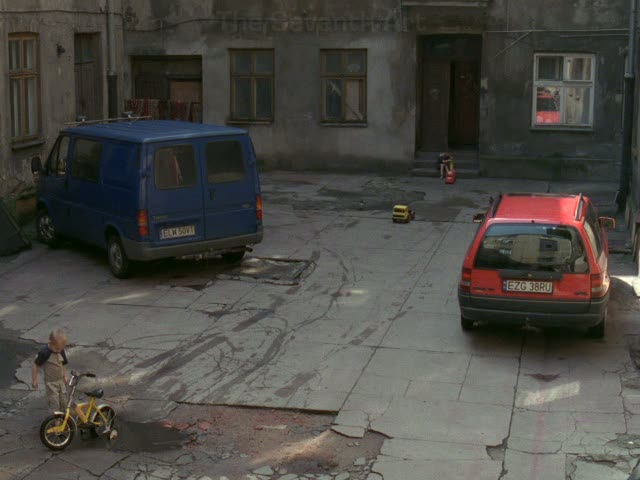 Podwórka (2009) is shot in Lodz, Poland and consists of six sketches depicting the kids of the neighbourhood playing with each other in the courtyards of the city. A miniature version of sorts of Pine Flat, this film, too, presents a string of vignettes from the lives of children of a particular city. But, unlike Lockhart’s earlier film which shot the kids from at eye level and from a close distance, the kids here are photographed with a detached perspective and in long shots as if integrating them with their environment. This, in effect, presents them as human elements maneuvering through industrial landscapes which are – a la Lunch Break – marked by rusted pipes and seemingly defunct structures. Like Pine Flat, Podwórka attempts to study a locality by viewing it from different angles and through different people and to synthesize a version of the region that stays true to the filmmaker’s experience of it (although I don’t understand the geo-specificity of Poland for this project) – as if trying to hold on to the fleeting memories of childhood, which is influenced only too deeply by one’s environment. If it was the green trees in Pine Flat, it is Lodz’s mellowed courtyards that seem to be engulfing the children in Podwórka. The soiled, dilapidated walls of the neighbourhood seem to be of no bother to the kids, who are gleefully engaged in playing with mud, bicycles, footballs and the surrounding buildings. In that sense, one could say that the film is, as is Weerasethakul’s debut feature, a paean to dead times of the afternoon and to the power of human imagination. Ah wonderful! This sounds like the kind of work that I have grown to like more and more, ever since I saw HOTEL MONTEREY by Chantal Akerman. I’ll watch those two films online and come back with my impressions. Thanks for the introduction to Mrs. Lockhart. I was thinking recently how people say “Why hadn’t I heard of this” when they come across something different and special. The truth is that if you want to find something different and special, sometimes you have to go looking for it. True Stephen. You more you wander into the wilderness the more you discover, I think. I’m yet to see Akerman’s film. There’s a lot of her films that I’d like to see. I’ve just seen LUNCH BREAK. You are absolutely right about the illusion of moving into a photograph, or into the infinitely receding vanishing point. The low hum and the slow deliberate movements bring to mind space (low gravity, cramped). It’s very eerie, almost horrific (ALIEN came to mind). I must say I wasn’t as mesmerised by it as I thought I might be (I stopped watching Teatro Amazonas quite early out of boredom) but it’s still an odd and compelling experience. I think it may have worked for me better if we stayed in one part of the corridor and watched a couple of the men over a longer period of time. By turning it into a journey you make the viewer impatient about reaching a destination. At least that’s the way it was for me. Thanks again. I’ll try and track down the rest, Goshogaoka especially sounds interesting. As for HOTEL MONTEREY, what’s interesting about it is how for most of its running time the ‘moving image’ is indistinguishable from a still image. Nothing changes. It also has no soundtrack whatsoever. It’s rather trance-like. Wow. Yet another figure obscured by society’s aversion to anything too intricate or varient in form. I have never even heard of Ms. Lockhart, but I must say I continue to be amazed at how you facilitate your voracious appetite for those diamonds in the ruff that much be researched, watched and deliberated on. In this sense my friend, as always, you are peerless. I am assuming these can be found on you tube. Obviously the second work interests me quite a bit, but the first one as some others here as well. Thanks Sam. I’m not sure if the works are available on YouTube. But you can find two of these in the link I’ve given at the end of the article. These all sound wonderful and will watch the 2 you’ve linked to over the weekend. Always interested in what you’ve written about. Thanks for stopping by CM. Horror is the one genre I’m farthest from. Have seen only 3 or 4 of the whole lot at WitD till now! yikes, sorry: doesn’t do anything for me. Not my cup of tea* :( But as Sam says, I appreciate JAFB for researching, analyzing, and above all, watching it! Well, I was there that day, at the Teatro. A bunch of americans came to our community and invited us to go to the Beautiful Teatro Amazonas and watch the Amazonas Classic Choir singing – and for free! Of course we would go. We waited and waited and the choir never showed up at the stage. From where I stand, what you actually see at this film is the reaction of a bunch of people realizing they were fooled. the poor translator had a very hard time trying to explain to us, afterwards, what that was all about. That’s quite an anecdote, Someone. That makes it more like a performance art even. I did read about the logistical details in one of Lockhart’s interviews, but this is terribly interesting stuff. Thats really sad! Ive been very interested in this wave of nonfiction films. But it’s interesting and sobering when you hear a little bit about the set up of the film and your sense that the film was achieving some higher level of authenticity (via it’s form) was actually a big illusion. This anecdote (if it is even true) means the film has similar exploitative consequences to that of Stephanie Spray’s MANAKAMANA, another championed film in this vein in which subjects are literally sitting uncomfortably in the fish-bowl-like cable car for as long as a film reel will last. It seems like its only when there are so many restrains on form, and when austerity is overprioritized by the filmmaker, that the films are failing ironically in what their austere form asserts about representation. To it’s credit, maybe, the film makes a statement purely about form (with its shot length constraints and that of the cabel car system) and a wholly unrelated point about how people who are camera-shy behave when they have no way out. The film’s several moments of pure human sweetness, for me anyway, are overshadowed by these issues. I still want to see Lockharts films and this anecdote won’t stop me. But I’ve really been wondering, the more I see of direct cinema and nonfiction films if this sort, do fiction films actually do better at their message-sending or -seeping?